Share the post "Travel Guide: Santander, Cantabria, Spain"
Admittedly, I regret not spending more time in Santander. My original plan was to visit San Sebastian and Bilbao for the 4 day weekend, but my host family had insisted that Santander was worth seeing. They told me it was only a short drive past Bilbao, but it ended up being about 1.5 hours by bus. Plan accordingly! I would’ve been happy exploring this lovely city the entire 4 days! Where is it located? Santander is located along Spain’s northern coast, in the Cantabria region. It is directly north of Madrid. What language do they speak? They speak Castilian Spanish. For some helpful travel phrases to help you with your journey, go here. For tips on how to learn languages with more success, visit my article 13 Tricks for Learning a Language. It is the home of the former royal summer palace, which was given as a gift from the public to the royal family. You can visit this lovely palace on the peninsula. Some historians say that the name of the city dates back to the 3rd century, when the head of a martyr, named Santemter, was brought into the city. Depending on where you’re departing from, you have many options for arriving to this lovely coastal city. I was departing from San Sebastian, so I opted for the bus. To compare your various options based on your location, I recommend using the website Rome2Rio. There is also an airport and train station, so you have many options at your disposal. Santander is about a 1.5 hour bus ride away from Bilbao. There are some lovely views along the way! There is also a train, I suppose it would take about the same time or perhaps a little less. However, be sure to plan ahead and buy your tickets in advance, especially on weekends. When I tried to leave on Sunday to return to Bilbao, I couldn’t leave in the morning like I had planned because both the train and bus were sold out! Luckily I wasn’t in a rush, but that could definitely ruin your trip. During the day, buses go to and from the airport every 30 minutes. During the writing of this article, a bus ticket was 2.90 euros. You can buy this ticket directly from the bus driver. It only takes 15 minutes to get to the main city center. The first bus leaves at 6:40am and the last one at 11pm. There are always taxis waiting out front, and if you’re a small group of people are are carrying a decent amount of luggage, a taxi may be the better option for you. Depending on the time of the day and where exactly you’d like to be taken to, the journey generally costs between 15 and 18 euros. For more information, visit here. It is easy to rent a car at the airport, and best if you reserve ahead of time online. It isn’t super difficult to find parking throughout Santander, but you will generally have to pay. The city center will be nearly impossible to park. For my visit, I stayed in a cheap little hostel on the outskirts of the main city. I was traveling on my own and didn’t plan on spending much time in the room, so it was perfect for me. There are also various hotel and Airbnb options. For advice on what type of accommodation to choose, or my favorite sites to find accommodations, read my article on How to NOT Spend Your Life Savings on Travel Accommodations. Peninsula of Magdalena – Beautiful views of the bay and nearby beaches, with free entrance to the park and zoo. You can go by foot (recommended) or pay extra for a little trolley to take you around. There is also the former royal summer palace at the tip of the Peninsula, you can pay extra to go in. Playa Primera del Sardinero – Lovely little stretch of beach with a promenade, definitely worth a walk around. There are many cafes and restaurants along the same stretch. Puerto Chico – Lots of fantastic restaurants and bars, a nice area to walk around near the port. Located a little south of the main city center, but worth it to check out. From here you can also watch kite surfers and see across the bay. Edificio del Banco Santander – A nice archway and courtyard in honor of Santander banks in Puerto Chico. Menéndez Pelayo Library – Beautiful library inside and out, with lots of stained glass and old wooden shelves stuffed to the brim with books. Gran Casino Sardinero – Across the street from Playa Primera del Sardinero. Nice building and worth seeing, even if you don’t gamble. Barrio Pesquero – Translates to fishermen’s neighborhood. A run down area, but worth a visit if you want to enjoy some of the best seafood. Quite a bit outside of the main city center. I came to Santander on a whim because my host family said it was worth a visit. When I researched the city, not much came up online. That worried me a little, because this would actually be my first trip ever alone (besides moving to Spain in the first place, that is). There weren’t many hostels available in the area either, so I had to find a small place on the outskirts of the city. Keep this in mind if you plan to take the hostel route! When I told people I would be going to Santander, most people asked “But… why? What’s there?” It’s true, it isn’t the biggest tourist destination, especially for Americans and Brits. But what I’ve discovered is that it is actually a pretty popular destination for Spaniards. If you’re coming to Santander by bus or train, you’ll be dropped off in this area. However, this is not the central part of Santander. At least, not where most of the touristy things to see are located. There is the port, which is quite nice to walk along, and there are many delicious pinchos restaurants to choose from. And, since it isn’t a huge tourist city, you can find some amazing deals on food! I had a lovely walk along the coast enjoying the view of the villages on the other side of the bay, which was pretty spectacular to see (even though the weather wasn’t fantastic). There are also a few parks along this route, with some nice sculptures to admire. Nearby, there is also a sailing school, so you’ll probably see some amateur sailors taking advantage of the day. In this area, there is also the original Santander Bank (if you don’t know why this should be important, don’t worry – it’s just a very popular bank in Spain). It is nice to check out, especially if you’re into architecture. It was built in the early 1920’s by architect Javier González de Riancho. As you wander along the streets nearby, you’ll find lots of cool street art- if you’re into that kind of thing. I walked around this city alone at night, and while I don’t recommend doing the same, it is a safe and beautiful city to explore if you have the time. If you wander back towards the coast, you’ll find some lovely parks and statues. Grab a gelato, take the hand of a loved one, observe the sailors… take advantage of the beautiful walk. It takes about 20 minutes to walk from the main downtown area of Puerto Chico to this region, and then perhaps 10-15 more minutes to reach the beach and peninsula region. There are buses that you could take, but as of May 2015, google maps did not have them listed in my phone. But I assure you, the walk is worth it! After walking along the coast, you’ll find yourself at a nice beach. There is a path that goes along the cliff, or you can slip off your shoes and enjoy walking across the sand. At the end of this beach, there will be another path that’ll lead you towards the main entrance of the park on the Peninsula. Not a shabby place to live, eh? 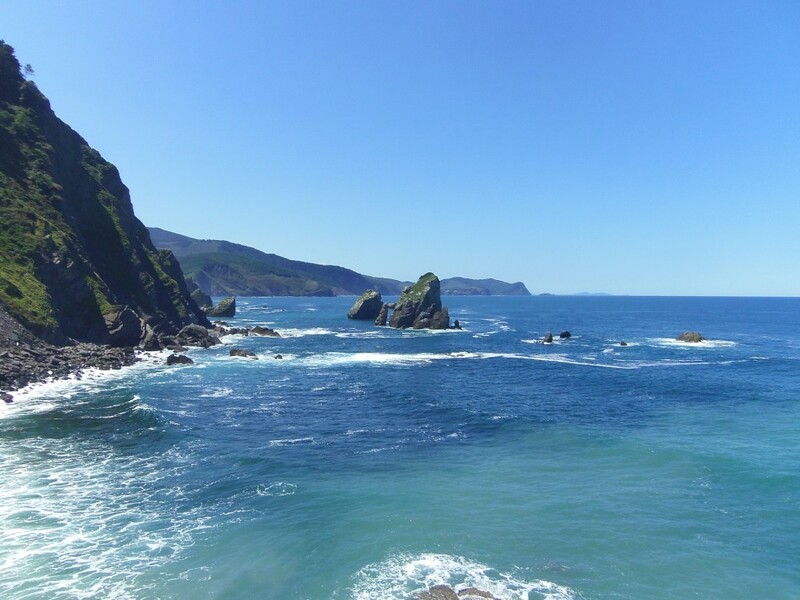 The Peninsula is definitely worth a visit, and many tourist sites recommend at least three hours to fully explore it. There is a huge park, a small zoo, and even a palace! The views from this peninsula are breathtaking, even on a cloudy day. And the best part? It is completely free! There are tours inside of the palace, which you can pay extra for. There’s also a little shuttle that you can pay for to take you around the peninsula, but I highly recommend just walking it. If you follow the path to the left first, you’ll find yourself at their small zoo. They don’t have much, but it is still pretty cool! There are penguins (a funny sight to see with the beach in the background) and seals. 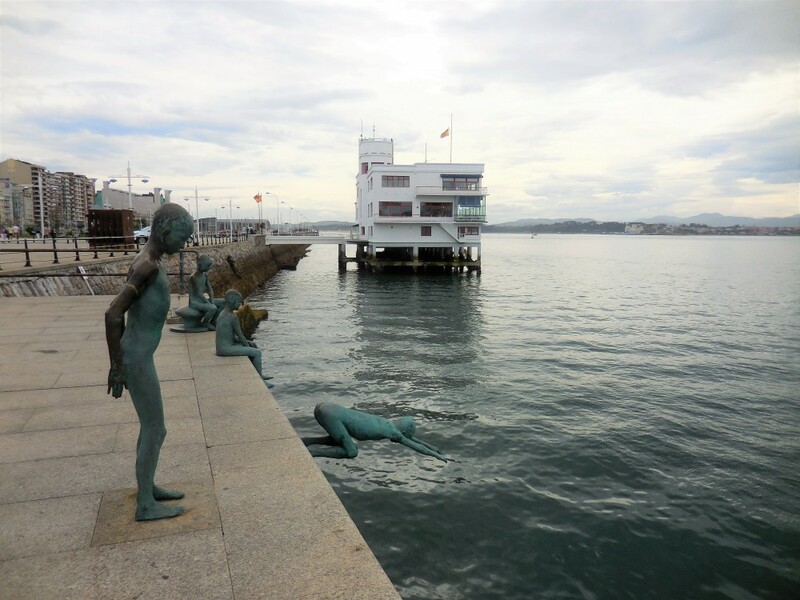 If you continue following the path, you’ll come across a mermaid with 3 ships – a very typical photo moment in Santander! Continue further and up the hill, stopping to admire the views off of the cliffs. After a few minutes, you will see the palace. It isn’t anything super impressive, but it is pretty. You can walk all along it, and then continue on the path back down the hill, on the other side of the peninsula. There are a couple of different paths that lead more inland or closer to the cliffs. When you loop back around the peninsula toward the entrance, if you continue through the gate and to the right, you will find yourself at another lovely beach called Primera Playa (or First Beach). The first thing you’re sure to notice is Peña Vieja (or Old Rock), with lovely views of the other main area of Santander behind it. I’m sure this beach would be lovely during the summer! I went during the Spring, and what with the climate being wetter in the North, the weather varies quite a bit from day to day. 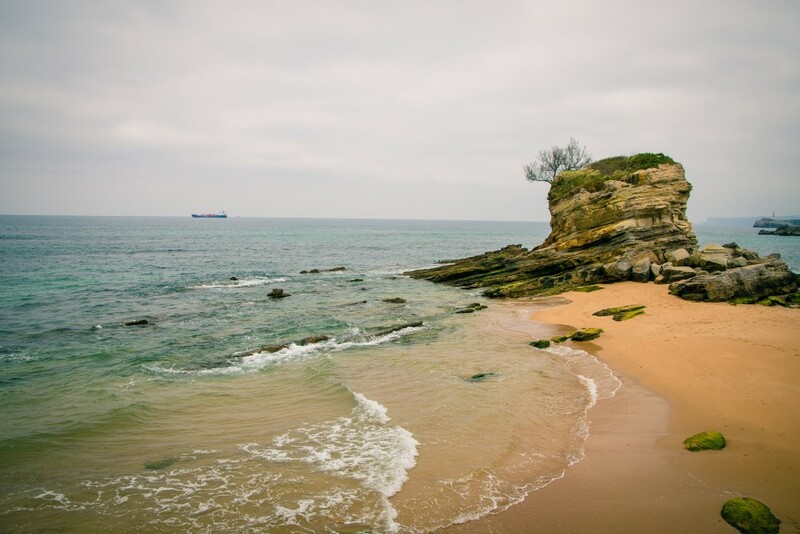 From there, walk further along the coast and you’ll find Parque de Piquío, a small break in between the two main beaches of Santander. They have some lovely gardens and benches and of course a magnificent view of the beach in both directions. After you’ve had enough of the beach (if you can ever have enough of the beach), you can head inland to explore the city area on this side of the peninsula. I noticed lots of unique buildings and enjoyed just strolling through aimlessly. In fact, since my phone wasn’t allowing me to find a bus route home, I just walked straight through the city to the other side and back to Puerto Chico (see above). This was quite a long walk, however, and if you could find an alternative route, that’d probably be for the better. Another popular tourist location on this side of Santander is the Gran Casino Sardinero. When I was there, there was a big formal event going on, so I couldn’t go inside. But other travel websites say it’s definitely worth a look, even if you don’t gamble! So, you’re in Spain. Of course you’re going to expect the best of the best when it comes to the gastronomical part of the trip. You’re in luck, because Santander has some amazing restaurants, both for a midday “menu del dia” and for some lighter pinchos in the evening with delicious wine. Some of the places I went to I had researched beforehand, and others I just happened to be hungry and went to the first place I could find. All of them were delicious – I think it’s hard to go wrong. My first night, after walking all through the city, I was exhausted. But I can never be too exhausted for a drink. I stopped in a themed bar named “Little Bobby Speakeasy.” It was still a little early in the evening, so when I entered, there weren’t too many other patrons. However, the place itself is quite lovely and well decorated in the 1920’s style. All of their drinks are inspired by old movies and TV shows. I highly recommend stopping by! Walking around so much built up quite the appetite, so I decided to go to a place that I had found recommended online: Dias Desur. I only planned on having one or two pinchos and some wine, but that turned into 4 pinchos and 2 glasses of wine. 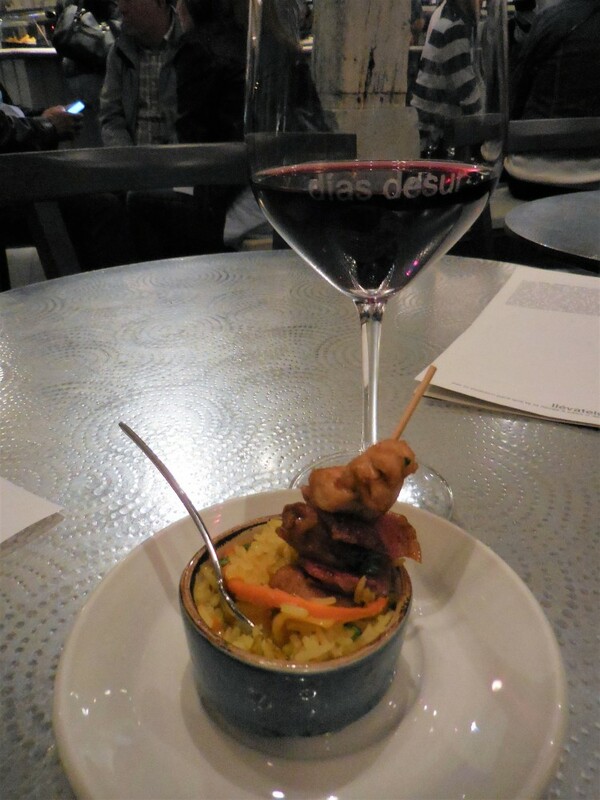 It was mouth-wateringly delicious, even after having such ridiculously decadent pinchos as I had had in San Sebastian. This is a must stop for anyone visiting Santander! It can get quite busy, but it is worth the wait. Something even as simple looking as the teeny weeny mini burger they recommended just had the perfect flavor combination to make my eyes roll back in delight. On my second day, I walked into a random restaurant along Calle Castelar near Puerto Chico. I ordered the menu del dia (if you’re unaware, it’s amazing – each restaurant puts together a couple of possibilities for a 2-3 course meal, generally with wine and dessert included, for a low, fixed price. I’m not talking about small dishes, either. I’m talking massive plates that’ll make you walk away wishing you had your big Thanksgiving pants) and was blown away by the food. Unfortunately, I can’t remember the name now, but I am pretty confident that you wouldn’t be disappointed with any options here. I forget what the name of this was, but it was an unusual name for pork… and it melted in my mouth. 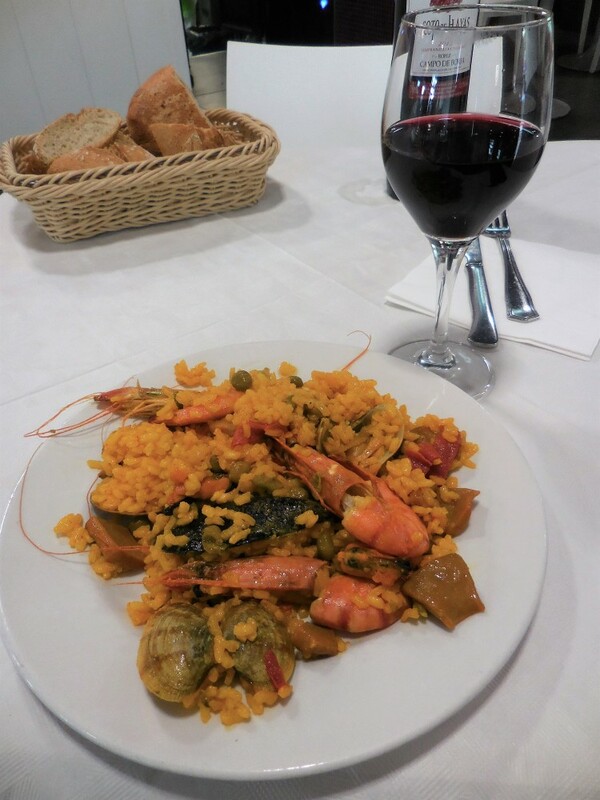 Don’t be afraid to be a stereotypical tourist… order the paella! Before catching my bus, I decided to stop at one last place in the Port area for some pinchos. This place was called Casa Lita, and it had a great variety of pinchos, although admittedly not as amazing as Dias Desur (it is hard to beat perfect)… but still quite good. I have heard of Santander the bank but didn’t realize it was named after a city. It looks like a great place to walk around and explore. So nice that the palace is free to visit and the food looks so good. Thanks for sharing on #TheWeeklyPostcard. My first year in Spain I used Santander bank all the time, and I had no idea either until my host family insisted it was worth a visit! Definitely a charming, coastal city – and good food always helps 🙂 thanks! Oh, I totally forgot how wonderful Santander is. I was there ages ago! Then again, I also forgot how changable the weather in northern Spain can be!! But all the food and wine does make up for it, doesn’t it? 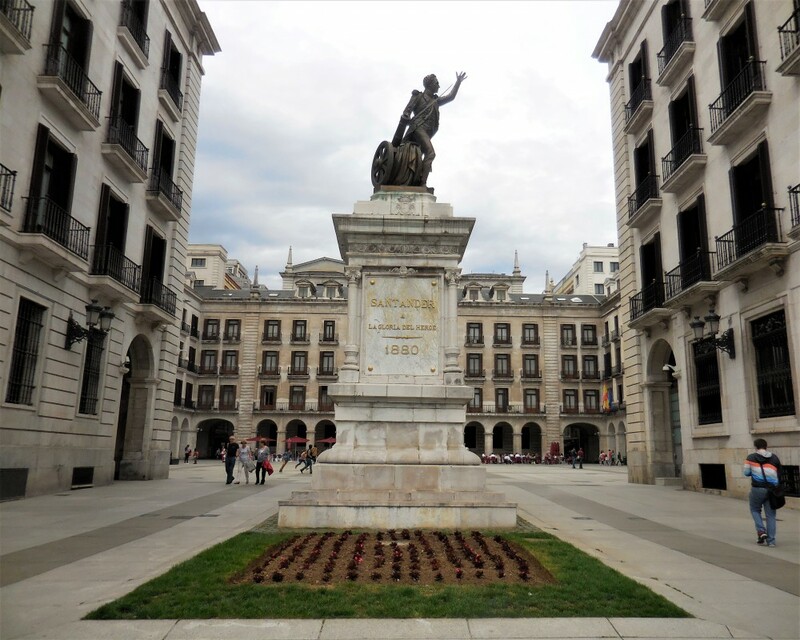 Yes, Santander doesn’t seem to be well-known to non-Spaniards, but I loved my experience there! Hard to go wrong with beach, pinchos and wine, eh? And yes, it’s true, the weather is a little bipolar. I started off the day with bright, sunny skies, and finished with super cold temperatures and overcast skies. But it just meant more pinchos for me haha. Bilbao and San Sebastián are amazing too! I’m dying to go back to the north of Spain, too. It’s so gorgeous and green. I suppose more people don’t visit because the weather is so variable, so people coming for the sun and heat might be disappointed… But the food and culture is definitely worth it, even if it rains! Hope you’re able to visit again sometime soon, I’d love to hear about your experience 🙂 happy travels, thanks for stopping by! Wow, what a coincidence, I’m glad I could put it back on your radar for you! It’s definitely worth the visit, I was super impressed with the buildings and atmosphere of the city, I don’t understand why more people don’t know about it! Thanks so much for reading, hope it helps you on your next visit 🙂 I am super excited to be a part of #TheWeeklyPostcard, everyone is so friendly and filled with lots of fantastic travel info! Happy travels!! Very useful guide to Santander. I’ve been in Spain a few times but never visited Cantabria. Those shores remind me a lot about the Pacific Coast, around Cambria. Thanks very much! And hmm wow, I can see what you mean! I grew up just a few hours south of there, there’s some similarities for sure. I highly recommend that you visit the North shore on your next visit to Spain 🙂 thanks for stopping by, and happy travels!! What a beautiful part of Spain I’ve never heard of! Looks so much more modern, so open and wide in many ways compared to other Spanish cities! That castle is beautiful! Thanks for linking up with #TheWeeklyPostcard! It’s definitely a different feel than many other Spanish cities, which just adds to it’s appeal 🙂 thanks for stopping by, it’s a pleasure to be a part of this awesome community! 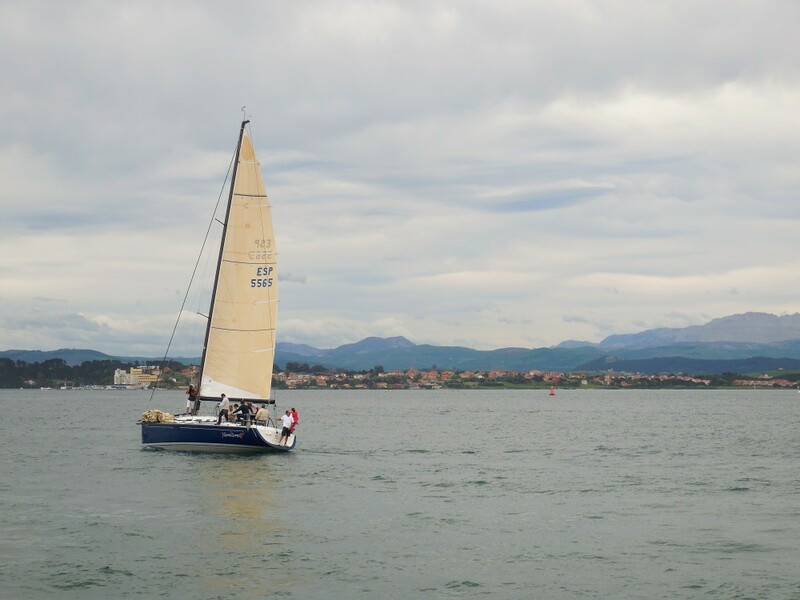 We’ve been to Santander a couple of times, when we have caught a ferry from the UK to tour Spain and loved it. 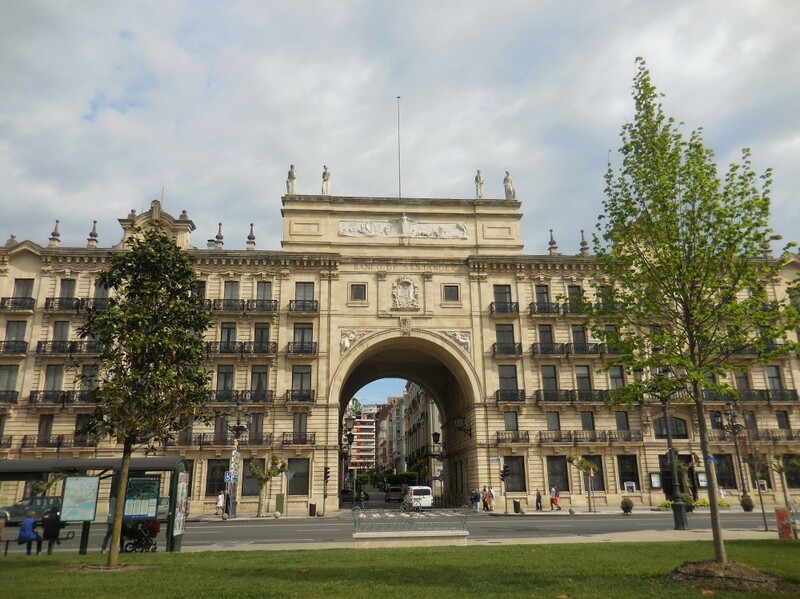 We did stay in the city, the first time was fairly brief but we enjoyed it so much, that the second time we did the trip we stayed an extra day in Santander. The north of Spain often gets overlooked and I find that such a pity. 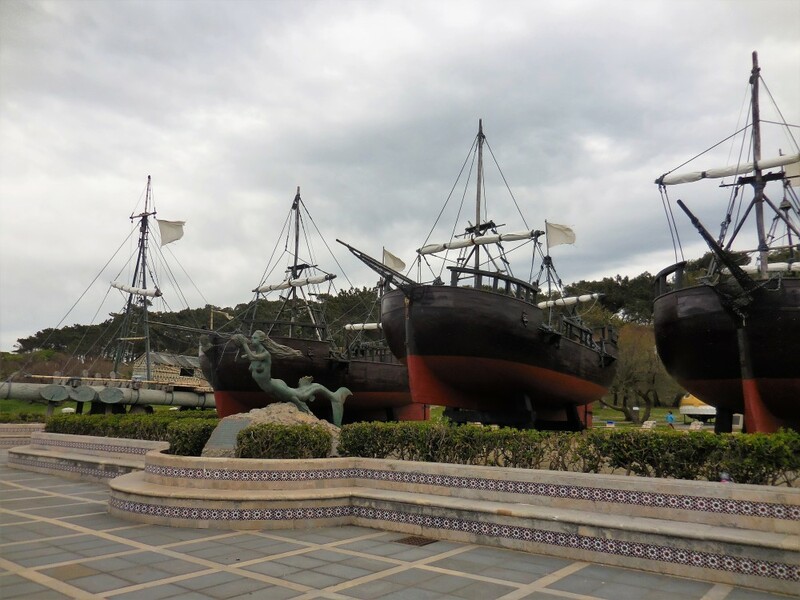 There are loads of fun places to visit in the north of Spain. I’ve visited Santander too a while ago, but didn’t spend as much time there as you did, good on you! Thanks very much! 🙂 I’m glad you got to enjoy this lovely city on such a special occasion! Thanks for reading!